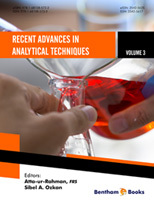 Recent Advances in Analytical Techniques, Vol. 3 presents comprehensive chapters on recent trends related to ionic liquids, chiral analysis, multi-parameter flow cytometry, electrospun nanofibers, neutron activation analysis, enantioselective chromatography, Ru(II)-polypyridyl complexes. We hope that the readers will greatly enjoy reading these excellent articles from eminent scientists in the field. We would like to thanks all the authors that contributed to this e-book for their excellent contributions. We would like to thank the Bentham staff including Ms. Mariam Mehdi (Assistant Manager Publications), Mr. Shehzad Naqvi (Editorial Manager Publications), and Mr. Mahmood Alam (Director Publications) at Bentham Science Publishers for their hard efforts and efficient interactions with the authors in the publication process.